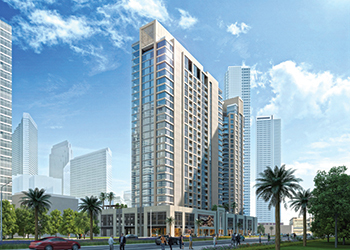 Dubai Properties (DP), a leading real estate master developer and manager, is set to launch Bellevue Towers, a two-tower project in Dubai, UAE, that is strategically located to offer seamless city views and delightful living spaces. The East and West buildings of Bellevue Towers have a total of 300 units across the 23 residential floors, ranging from one-, two-, and three-bedroom apartments to three-bedroom penthouses and lofts with contemporary designs. In addition to two main lobbies set on a common podium and retail stores on the ground floor, the project boasts a variety of residential facilities including a gymnasium, a pool, a playground, lawn and social terrace, all creating a comfortable and energising lifestyle. Bellevue Towers is located a stone’s throw away from Marasi Business Bay. The towers are surrounded by carefully crafted green spaces, extensive retail, hospitality, leisure and dining options, presenting an ideal location to live, work and indulge in a dynamic lifestyle. The project is scheduled for completion in 2019.